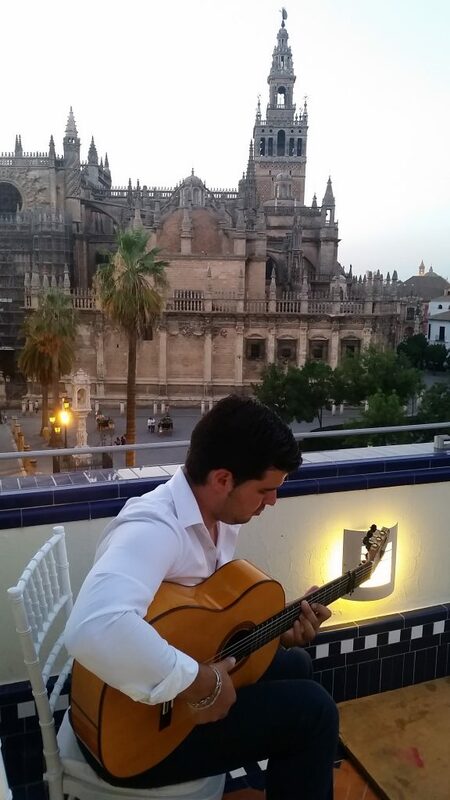 On a mild summer’s evening in Seville, there is no better place to be than on a private roof terrace, with a cool breeze and views of the cathedral! A couple of days ago we had some very special clients visit us from the U.S. They were enjoying a family reunion that involved visiting Madrid, Seville and then spending their last few days, relaxing in Marbella. 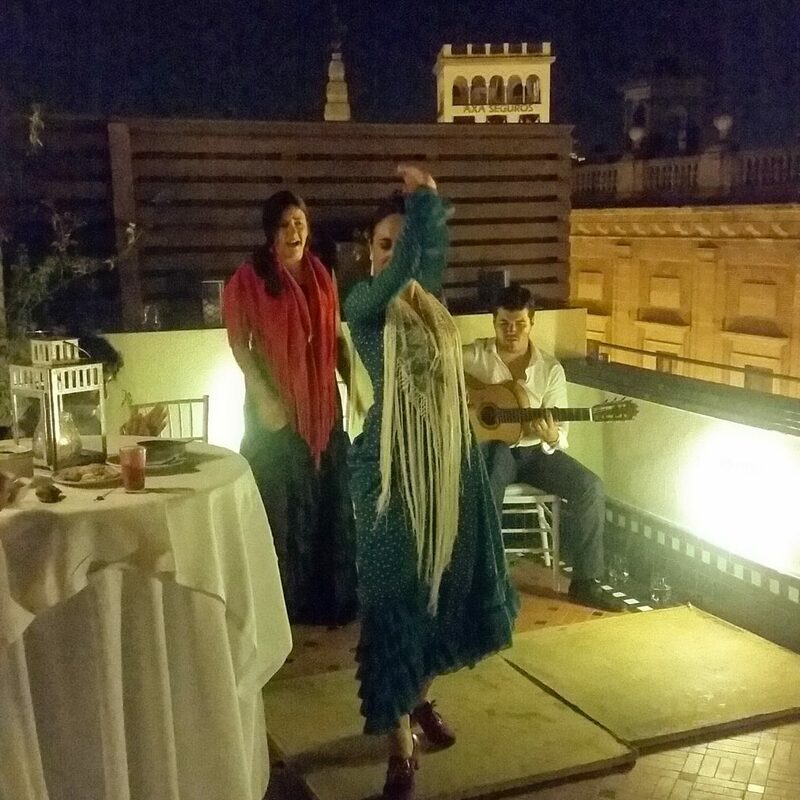 One of the special experiences that we arranged for them involved a private roof terrace with views of the Alcazar, the Archive of the Indies and the Seville cathedral. After a pleasant carriage ride from their hotel, through the park and the Maria Luisa park and the Plaza de España, they pulled up at our roof terrace. On arrival they were greeted with an ice cold glass of “Fino” sherry, served by a venenciadora. This involves using a venencia, a steel thimble-like cup attached to a long and slightly flexible pole that is use to plunge into the barrel and withdraw the wine without damaging the layer of yeast that rests on top. The wine is then poured into a sherry glass with a flourish and a steady hand!! Somehow it tastes better served like this!! 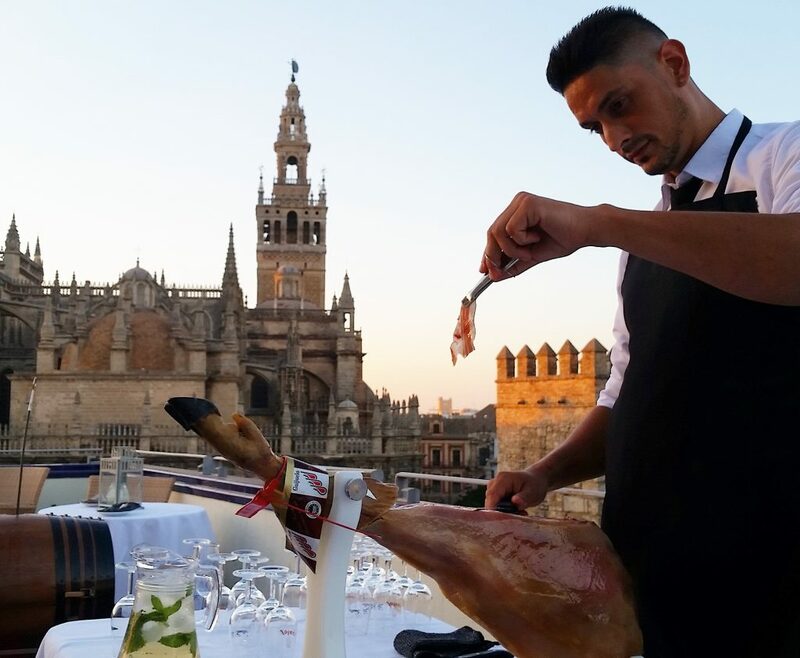 They were also greeted by a professional jamon cutter who was preparing wafer thin slices of one of the finest jamons we had ever tasted! Guests were offered an original type of sangria, served in water bags with straws as well as “rebujito” (a sherry spritzer made up of fino, lemonade and mint leaves), glacial beer and a selection of wine. As the canapés started rolling out, people enjoyed taking photos of the view and the sunset. It was then that our flamenco friends began their performance! We were all privy to a very special exhibition of numerous flamenco styles involving guitar solos, heart-felt singing solos, passionate dancing, sevillanas and more!! Those who were interested, joined the dancers to learn a few steps themselves!! As the night drew to a close, we all sat around, chatting with the flamenco artists about the world of flamenco and the trials and tribulations involved in becoming a flamenco pro!! The evening ended with a leisurely stroll back to the hotel with full stomachs and happy memories! Posted in Culture, Sevilla, Think outside the box and tagged bespoke, flamenco, private experience, seville, tailormade.